If you don't already know, I am an organic products lover and what goes onto our skin are as important as what goes into our body. That of course, includes what we clean our face with, especially when you cleanse twice daily (or at least that's what you should be doing if not already). Once in the morning, once before you go to bed. 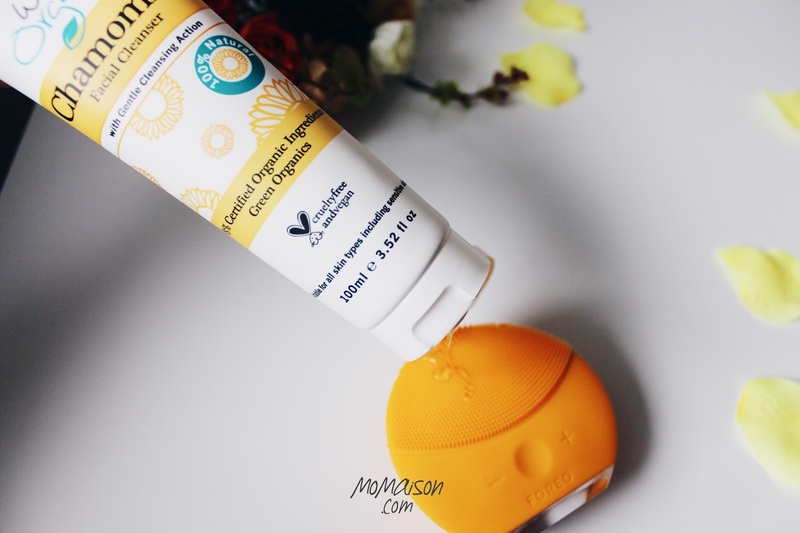 So when I got this organic and natural Chamomile facial cleanser from Winter Organics which is gentle and suitable for daily use, I was excited to use it, especially since I could use it with my Foreo Luna Mini 2. It works well with the Luna Mini 2 as it has silicone bristles and could not be used with microbeads, which this facial cleanser does not contain. Anyway, according to CNN and Vogue UK, microbeads has been banned in the U.S. in December last year and "as of September 2016, British MPs have promised a ban on their use in cosmetics and cleaning products by 2017". So say bye to exfoliating beads! 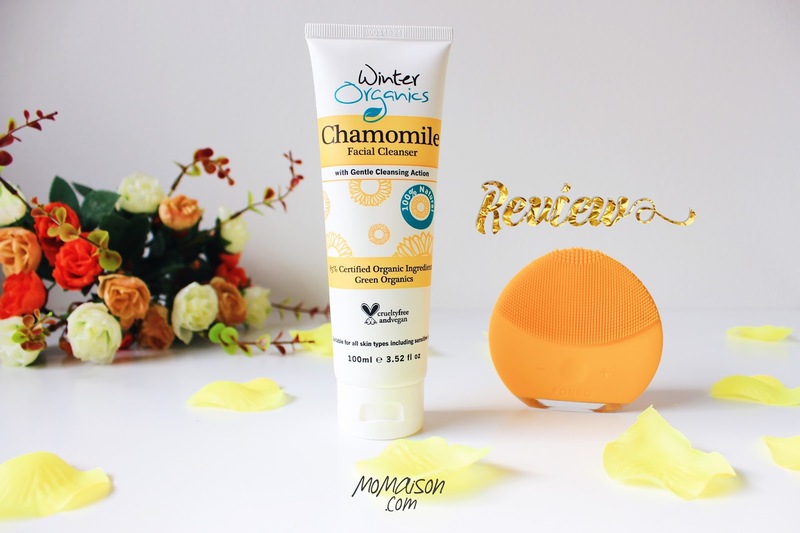 My initial thoughts of the product was that it smells good and natural (like the Chamomile hair & body wash we got for Hansel which I have used to wash my face with HAHA) and of the packaging, it's bright and velvet smooth, it doesn't feel like the regular cleanser plastic. But, the downside was that the consistency is too watery, making it difficult to control the product amount. Both Daniel and I have tried this product. I'm not sure about Daniel but I personally loved everything about it. I have used it 1x a day for a week and 2x a day for the second week, every time in conjunction with my Luna Mini 2. And Daniel, only whenever he showers, with my Luna Mini (1st gen). I have come up with a beauty products review reaction timeline to aid with my blogging and providing readers a more in-depth review of a product after a longer period of usage rather than first impression reviews. So I have used that to record my skin reaction and thoughts after every use. I am not exaggerating but there are not much changes in my thoughts of it after every use since I started using it. After each use, my face felt clean, fresh and smooth. It is not too stripping (I have tried other cleansing products that made my face felt really stripped) and face stripping is not good for the skin! When your skin is stripped, it brings on acne, oil and infection, as the skin acid mantle (a barrier against bacteria) will be diminished, and to counter, it stimulates your skin to produce more oil/sebum to rebuild the barrier. It actually gives me a natural slight blush the following mornings and my face still felt smooth. I had to add a splash of water onto the Luna Mini in between cleansing as there was very little lather. But that is because the cleanser is 100% derived from plant sources with no SLS, therefore lesser foam would be produced. If you prefer it to be more foamy, just lather up with water. I also learnt that squeezing the cleanser more evenly over the Luna Mini instead of just at one spot helps. From their Instagram @winterorganics, I have also found a useful #winterorganicshack, a DIY make up remover with this product. All you need are 3 tablespoons of Organic Cold Pressed Coconut Oil, 5 tablespoons of Winter Organics Chamomile Facial Cleanser, 20 ml of distilled water (mineral water or aloe vera/rose water would be even better) and a clean storage bottle. Add all ingredients into the storage bottle and shake to mix well. Use it with a cotton pad and wipe the desired areas. All in all, I really enjoy using this product. 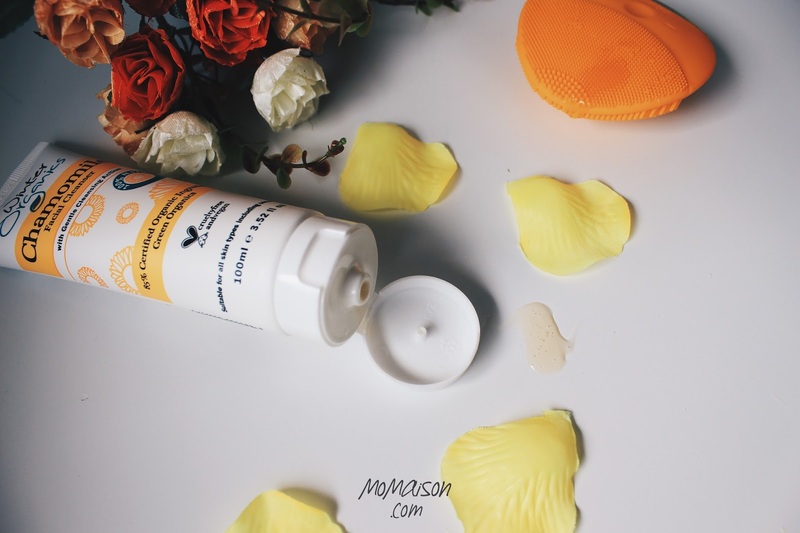 I cannot tell if it helps with acne yet, as I have only switched to all natural skincare products not very long ago, and I have had breakouts on my forehead as my skin is purging out the toxins and adapting to the new natural products. I believe my skin will start to change for the better and it will all be worth it soon. Besides the fact that I love the feel of using it, products from Winter Organics are cruelty-free and vegan, 73% - 95% Australian Certified Organic (not 100% because certain ingredients do not exist in organic forms) and they use biodegradable packaging. They have also recently launched 4 new products — Cacao Facial Scrub, Calendula Shower Gel, Macadamia Hand & Body Lotion & Macadamia Hand Cream — and they are currently having a launch promotion with 30% savings off their Skincare Bundle which consists of all 5 products!!! Free shipping within Singapore and International Shipping above SGD $50!